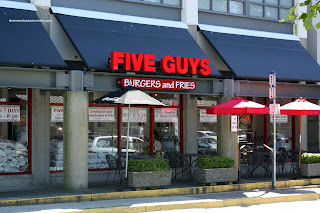 The first time I ever heard about Five Guys was last summer in Portland. I had planned to give them a visit; but alas, too much eating and not enough time! Despite what you think, I do have my limits. Originating out of Arlington, Virginia, the name represents the founder and his 4 sons. It started off as a small operation; but as its popularity grew, franchising followed. 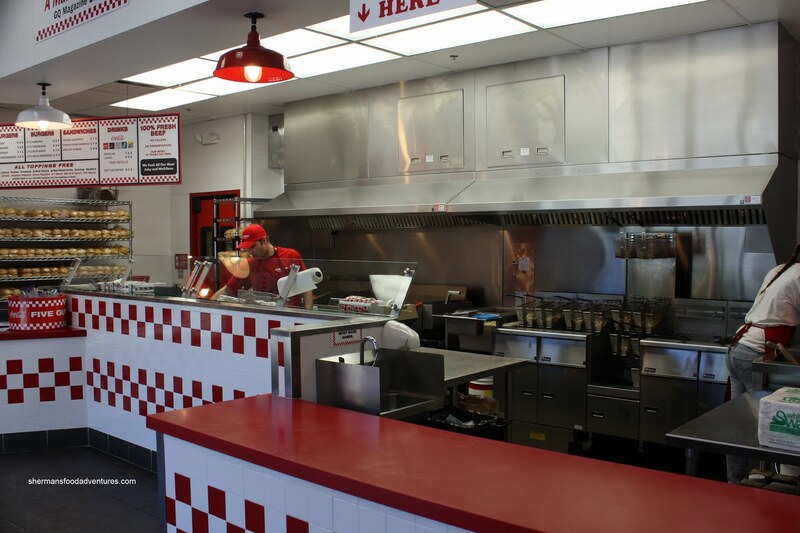 There have been comparisons made with another popular hamburger chain, In-N-Out. However, in my opinion, they are very different. More on that later... Now, I've been waiting for In-N-Out to come into Canada; but honestly, I think I should settle on Washington State instead. 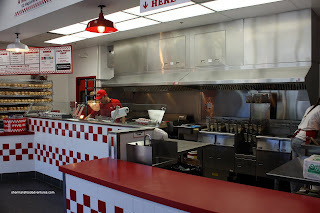 Unlike Five Guys, In-N-Out does not venture far from it's routes in California. 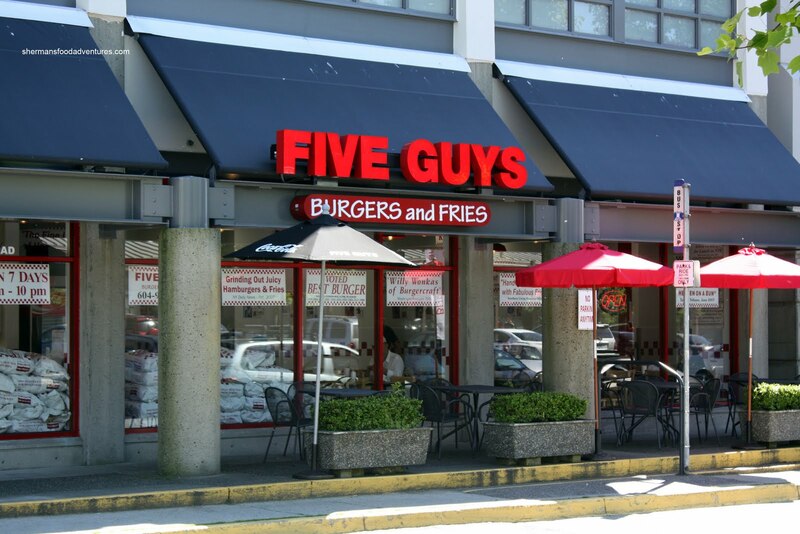 So when I saw that Five Guys were coming up to B.C., I was anxious to give them a try. Originally, I was eying the Langley location (which still has yet to open); but the West Vancouver location opened first. Kim had already trekked out there and finally I got my chance. After giving Nimby another chance with their fries, I decided to head over the Lion's Gate to Park Royal. 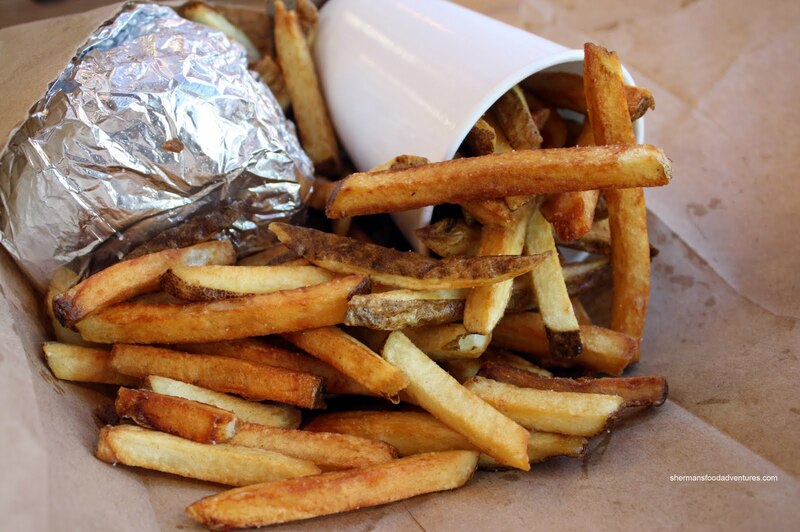 Exactly like other Five Guys locations, there are bags of potatoes (specially grown for their fries) near the front entrance. Also, complimentary roasted peanuts are there for the taking as well. 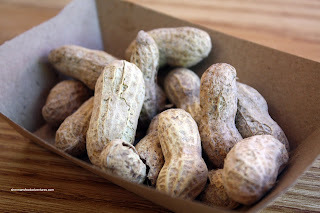 Honestly, these were pretty good peanuts. Big, with a nice roasted flavour, I could've eaten quite a few of these. But I actually got them after I had finished my meal and I was very full. Looking at the menu, I only had one burger in my sights, the Bacon Cheeseburger (which comes with 2 really large patties). Included with the burger are a multitude of complimentary toppings which include grilled mushrooms and onions. I've seen big burgers in my time; but I have to admit that this one was plenty big. At almost 1000 calories, this is not food for the feint of heart. At the heart of the burger are the 2 aforementioned patties. They are fresh and flame-broiled. They were not juicy per se; yet still somewhat moist and exhibited a noticeable beef flavour (they cooked their meat well-done). I liked how they made the pieces of very crispy bacon "fit" within the burger. Thus, I had bacon in every bite. I did not like the mushrooms very much. Hard to explain; but they almost seemed canned. However, the burger as a whole was quite good and messy. Now back to the comparisons with In-N-Out. 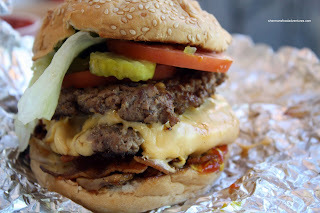 I feel that Five Guys offer a more substantial burger much like Vera's and Fatburger. In-N-Out, much like Nimby (a local example), is more focused on the simple burger. 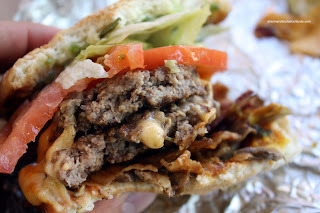 No fancy toppings, no humongous patties and a much lower price point. As for the Fries, there is no need to get any size bigger than a small. They end up cramming the bag full of fries anyways. Fried in peanut oil, the fries certainly have body. They're generally crisp with a definite "potato-ness" to them. I liked them and would 've eaten more if I hadn't already had a full order of fries from Nimby. Combined with a large drink, my meal came out to over $15.00. I do understand that I got the most expensive burger and it is more than enough for one person without the fries. However, much like Fatburger, Vera's and the sort, it is becoming the norm to spend that amount of money for gourmet burger and fries. Much like Kim, I feel that if you want a freshly made burger with fresh cut fries and a soft drink, go to Burger Burger. You'll spend 1/3rd of the price. Yes, one of these days, I will have to go to In-N-Out to do yet-another comparison. Alas, I have no plans to fly to those states where they have it anytime soon. LOL... They're similar but different at the same time. We do agree on Burger Burger though. Still the best deal around. Yah, In-N-Out is a definite visit. Greg, yah, I liked the burger and fries. A bit pricey, but I can't deny it was good. Thanks for the info on the new location!